Still in the process of tinkering with the blog. I'm appalled to read some of the early posts. At least I tried. Doing a little editing. Here's a repost of May 6, 2009 - freshly edited. Garbage patches are on my mind lately. I first read about them in The Perfect Storm while visiting Kauai. As I read the novel, the massive power of the nearby ocean gave me that butterflies-in-the-stomach feeling. I've almost always lived on the coast and I swear the ocean around Kauai is especially wild. 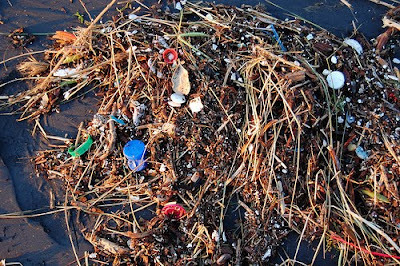 It seems crazy that mere pieces of plastic threaten our all powerful oceans. It wasn't until I saw Fabien Cousteau on Oprah that I started to understand what an urgent problem it really is (remain in denial if you must, Oprah hater). 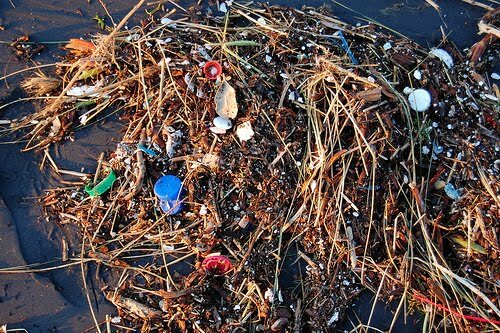 If you live in the Pacific Rim, you are part owner of the Great Pacific Garbage Patch. If you live elsewhere, you own a similar creature with a different name. The Great Pacific Garbage Patch, also described as the Eastern Garbage Patch or the Pacific Trash Vortex, is a gyre of marine litter in the central North Pacific Ocean located roughly between 135° to 155°W and 35° to 42°N estimated to be twice the size of Texas. The patch is characterized by exceptionally high concentrations of suspended plastic and other debris that have been trapped by the currents of the North Pacific Gyre. I thought about this mass of floating plastic as I walked up and down the aisles at Toys R Us recently, searching for Violet's third birthday present. I confess there is a plastic mass in my home. I know people who are more careful than me about avoiding plastic, but as a parent it is hard to avoid it when you consider the car seats, strollers, high chairs, bottles, sippy cups, safety gates and mountains of toys. At some point, I accepted it. I once wrote a paper on W.B. Yeats' belief in mystical gyres. He believed that human history was somehow cyclical, forming into a gyre that was spiraling out of control and heading towards total collapse. He also believed this was reason to celebrate and throw oneself into the arts and sensual pleasures. Every time I hear about the gyres of plastic in the ocean, it brings to mind the idea that the end is near, but not the end of the world in a born-again Christian type of way. Just life as we know it. Being an optimist, I don't think we're heading towards gloom and doom but change and rebirth. Not that it will be painless, as change involves parting with the familiar and birth is really painful. But when I'm not feeling sorry for myself, I believe in the goodness, resilience and ingenuity of the human spirit. I decided to go with bongo drums and a watercolor set for Violet's third birthday. There was a minimal amount of plastic and packaging. Violet likes to play on Grandpa's bongo drums. I thought she might enjoy her own child-sized version. Still, I wasn't sure what she would think - if she would merely throw them aside and go on to the next present or what. When she opened the drums, she said "OOOHH" and pointed to Grandpa. Then she gave a few pats to her new bongos. Just take it as a hopeful moment.